I became a car guy when I was about 6 years old, reading Road & Track. I also discovered what was Competition Press way back when. My first racing experience was in the Soap Box Derby at age eleven. I built my own car but alas finished second in my heat. I didn’t get my first real car until I was out of college; it was a Navy Blue ’63 Vette convertible purchased for $1600. I’d like to have that one back ! Career and family then dominated my life until I had my mid-life crisis at 42 and decided it was time to get my license and do some road racing. I went to an HSR driving school and the bug hit hard. Over the next 18 years I raced a variety of racing venues including HSR (mainly) , SVRA, and various drivers schools with Porsche/BMW/Audi etc. I raced everything from a factory built ’91 Camaro Firehawk car, to a ’66 Mustang once raced by Gene Felton , to a ’65 Corvette and most recently a 2007 Corvette. I have raced at Road Atlanta most frequently (my home track) but have been to Road America, Watkins Glen, Savannah, Sebring, Barber, Atlanta Motor Speedway and Charlotte. My street cars are a new MB CL 550, a 2007 Corvette Coupe a new Cadillac CTSV (on order) and a Ford Expedition tow vehicle. 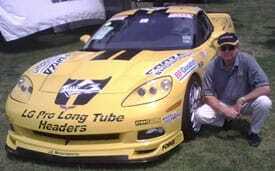 I currently am running a 2007 Corvette built by Lou Gilotti , the famous Corvette racer, for track events. Every aspect of the car has been upgraded for the track including the motor, suspension, brakes, safety equipment, etc. The balance of my collection is currently weighted towards Corvettes and muscle cars including a ’63 fuel injected split window coupe, a ’64 corvette convertible, a 69 Shelby GT350 coupe and a ’56 Ferrari Modena (one of 54). To pay for all this motorsports madness , I spend days as the CEO of a global consumer products company called Spectrum Brands. We make Remington personal care items, Rayovac batteries, and a host of other consumer products. Our headquarters is here in Atlanta but we have plants and offices all over the world. I have been waiting for a private motorsports club to come to Atlanta for years and am thrilled to be able to look forward to having such a great facility so close to home. While this will be primarily for my personal pleasure I’m sure opportunities to utilize the facility for business entertainment will also play in the mix.